The province’s low-priced electricity helps make electric driving more affordable in Manitoba than in most other jurisdictions. While the purchase price of an EV is currently higher than that of an equivalent, gasoline-powered vehicle – over time, fuel savings and reduced maintenance more than makes up for this difference. And keep in mind that EV purchase prices are expected to go down as automakers manufacture more of these vehicles and roll out new models. For example, based on annual commuter-type travel of 12,000 kilometres (km) per year/(230 km per week, fuel costs for a new Nissan Leaf S model, over eight years, are estimated at $2,400. Compare this to the $14,000+ in fuel costs for a similar-sized, gasoline-powered vehicle. 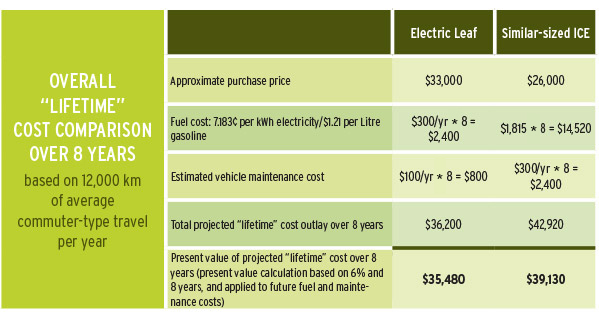 These costs are based on year-round, average fuel-consumption values of 12 litres (l) per 100 km for the gasoline vehicle; 35 kilowatt hours (kWh) per 100 km for the Nissan Leaf; an average gasoline price for 2012/2013 of $1.21 per litre; and a price of 7.183 cents (¢) per kWh for residential electricity. In the future, gasoline and electricity prices will both likely increase; however, electricity price changes are generally smaller, much less frequent and much more predictable than gasoline price changes. More detailed economic evaluations of electric vehicles in Manitoba, including specific models, are available at the site of the Electric Vehicle Technology & Education Centre (EVTEC) at Red River College. For more information about cost, refer to the Electric Vehicle Energy Cost Calculator on the Canadian Automobile Association’s website. From 2008 to 2011, a major demonstration was undertaken in Manitoba. The goal was to gain experience before commercial, battery-electric vehicle (BEV) and plug-in hybrid electric vehicle (PHEV) models were available from manufacturers. The demonstration involved converting 10 Toyota Prius units to PHEVs, using technology from A123Systems Inc. At the time, this was one of the largest demonstrations of its kind in Canada. Manitoba was, in fact, setting the stage for the broader introduction and adoption of commercially-available EVs in the province. 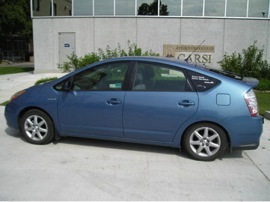 The first vehicle conversion, under the demonstration, occurred in the fall of 2008. The remaining nine vehicles were converted in the spring of 2009 – these conversions were undertaken by staff at Red River College. Performance monitoring was completed in the fall of 2011. The demonstration was administered by a non-profit organization, the Centre for Emerging Renewable Energy Inc.
Commuter applications were best suited to PHEV operation, and achieved the best fuel consumption performance. Cold-weather operation represents an important requirement for vehicles in Manitoba, and cold weather issues with the test vehicles were addressed. The focus of the demonstration was to confirm the performance of the technology rather than the economics; however, the PHEV test vehicles showed advantages in operating cost. Significant emission benefits were estimated for PHEV operation in Manitoba by shifting energy requirements from gasoline to electricity. Remaining available range on an electric vehicle is critical for any driver to know. This is particularly important for battery-electric vehicles (BEVs) since there is no available liquid-fuelled engine to operate as backup once the batteries are depleted. All EVs include readouts on the driver display to inform the driver of how much range remains at any given time. Unfortunately, all these range projections and associated prediction algorithms tend to be tricky. Monitoring both the Nissan Leaf and the Mitsubishi iMiEV in Manitoba, in conjunction with EVTEC, has shown that on-board range prediction indicators can be unreliable; more importantly, they vary erratically relative to the actual travel by the vehicle. It was initially thought this problem could be Manitoba-specific, due to cold weather conditions; however, summer-based range predictions have been equally unreliable. As part of its work, EVTEC has recommended that better tools are needed for drivers of EVs, so they can obtain accurate and consistently reliable indications of available range. Hoemsen, R., and R. Parsons. 2010. Manitoba PHEV Demonstration. EV2010 Conference, Vancouver, BC. Electric Mobility Canada. This presentation is available to the public. Click here for link. Parsons, R. 2011. Manitoba PHEV Demonstration: Experience from aThree-Year Collaboration. EV2011 Conference, Toronto, ON. Electric Mobility Canada. This presentation is available to the public. Click here for link. Parsons, R., and R. Hoemsen. 2012. Advancing Electric Vehicle Adoption: Insights from Manitoba Experience. EV2012 Conference, Montreal, QC, Electric Mobility Canada. This presentation is available to the public. Click here for link. Manitoba’s cold winter conditions affect all vehicles, whether gasoline-powered or electric. A number of organizations in Manitoba have been doing testing on a variety of EVs, with particular emphasis on cold-weather operation. The biggest impact of cold weather is cabin heating. This is required to ensure visibility through defogging/defrosting of windshields/windows, and to provide passenger comfort. Battery electric vehicles, which are all-electric, are most negatively affected by winter operation. Cabin heating consumes energy from the battery, which reduces effective driving range. Testing of Leaf and iMiEV all-electric vehicles by IEM and EVTEC suggests that, through the course of an average Manitoba winter, electricity consumption is approximately 2.5 times higher than the average baseline summer operation (without air conditioning). As a result, on average, vehicle range during the winter is reduced by the same factor. The Nissan Leaf can travel, on a single full charge, upwards of 160 km during the summer and only about 60 km to 70 km during the winter. Similarly, a Mitsubishi iMiEV can travel, on a single full charge, upwards of 130 km during the summer and only about 50 km to 60 km during the winter. As the temperature becomes very low, range is further reduced. Although these reductions, at first glance, may seem high, the average daily travel by all Manitobans is approximately 43 km, and typical commuting distances within Winnipeg are rarely more than 30 km per day. This means that even under the worst conditions, EVs can still complete the basic driving needs of many vehicle owners. Furthermore, given the large availability of plug-ins for block heaters, many Manitoba drivers will be able to ‘top up’ while parked at work. This can be particularly important during the winter months. Refer to EV Charging and Infrastructure for more information on this topic. For PHEVs like the Chevrolet Volt, the Ford Fusion Hybrid Energi or the Toyota Prius Plug-in, the main effect of cold weather operation is that it reduces all-electric travel range, and the vehicle turns more quickly on its gasoline engine. Otherwise, PHEVs act just like conventional ICE vehicles. Some issues with 12-volt batteries were discovered in early testing, but this is also a concern for conventional, gasoline-powered vehicles. The network of charging stations that support electric driving is expanding all the time, and Manitobans can expect to encounter more EV charging stations every year. The Canadian Automobile Association (CAA), in partnership with Plug’n Drive Ontario and Electric Mobility Canada, are attempting to track and display EV charging stations as they pop up across Canada. To find a charging station near you, go to www.caa.ca/evstations.